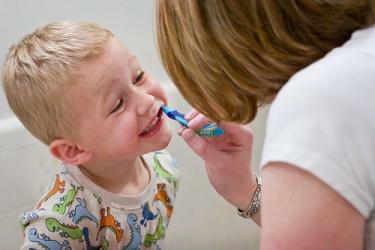 For children younger than 3 years, caregivers should begin brushing children's teeth as soon as they begin to come into the mouth by using fluoride toothpaste in an amount no more than a smear or the size of a grain of rice. The Council stated, "This regimen is intended to maximize the caries-preventive benefits of fluoride while further reducing the risk of developing fluorosis when compared to the previous recommendations." The complete review is published in the February 2014 issue of the Journal of the American Dental Association.